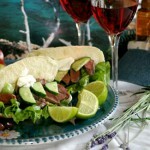 Thinly sliced pigeon breast in pita bread with ice berg lettuce and mint yoghurt dressing. Remove the breasts from 8 pigeons; roast the rest of carcass to make great stock for the winter seasons. Fry the pigeon breasts in garlic, thyme and lemon juice and serve rare. Then set aside. Empty a tub of natural yogurt into a blender and add a good hand full of fresh mint, blend and set aside. Fill the pita bread with ice berg lettuce and chopped cucumber; add the thinly sliced pigeon breasts and mint yogurt dressing and serve- maybe with some Kalamata olives and a glass of rosé wine on the side.